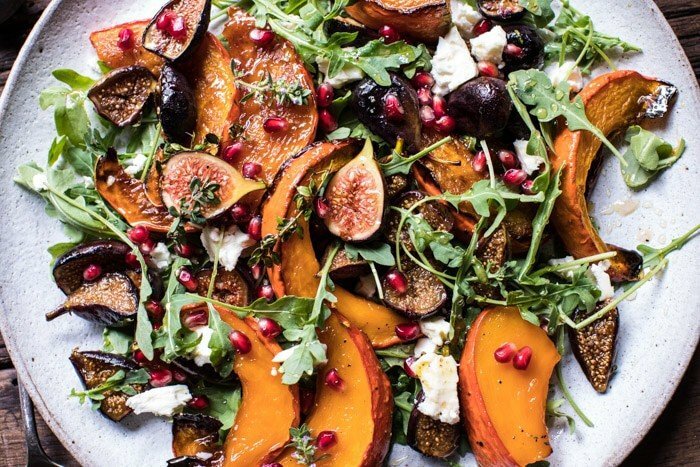 Declaring this honey roasted squash, caramelized fig, and feta salad, the official HBH salad of fall 2017. Is that kind of a bold statement? Probably. Will I most likely change my mind when I show you my Thanksgiving salad this November? Probably. Uh, maybe that salad can be the official HBH salad for Thanksgiving 2017? For the time being though, this salad is my current favorite, and I think it’s pretty obvious why. 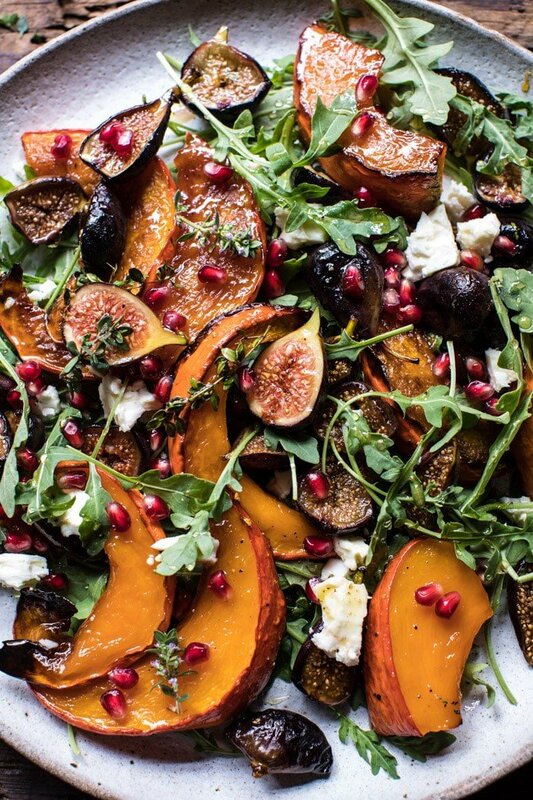 Hello to honey roasted squash, sweet caramelized figs, and feta cheese. So basically of all my current favorite fall foods! Oh, and pomegranate too, I am obsessed, but my guess is that you already knew that. Here’s the deal. I have been wanting to make this salad now for months, ever since the end of August actually. Okay so maybe not months, but for a while. I have been waiting and waiting for the kabocha squash to finally arrive at my grocery store. It seemed to take forever, but sometime in mid September the kabocha squash rolled up on a truck and I literally bought them all. 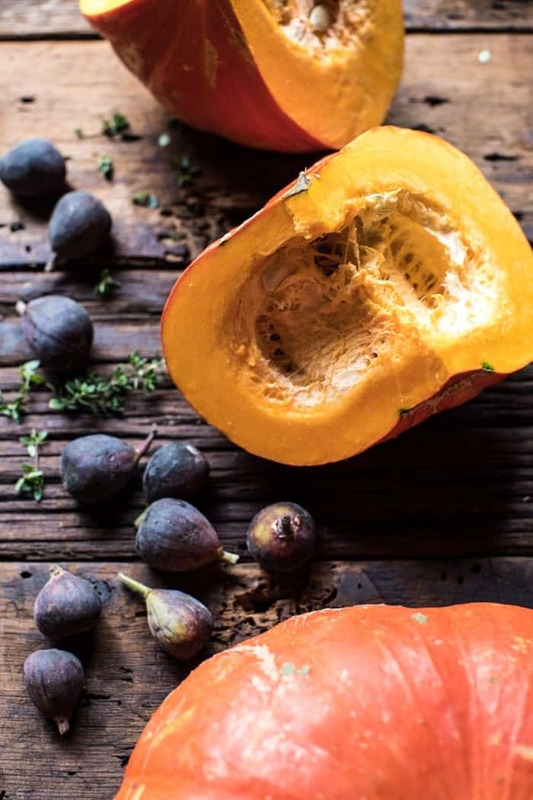 If you’re new to kabocha squash, it’s just another type of winter squash. It’s often used in Japanese cooking, but can be used in pretty much any recipe that calls for the more common acorn or butternut squash. And if you can’t find kabocha squash in your grocery, just sub in acorn squash. 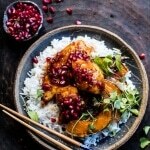 Ever since I made this sheet pan sticky pomegranate chicken with roasted squash last October I have been way too in love with kabocha squash. It’s buttery, sweet, and when roasted? Well it’s just the most delicious thing ever. I’ve known for a while now that I wanted to create a salad recipe using kabocha squash. I also thought it would be nice to include my other favorite fall ingredient, figs. And yeah, I know some of you don’t love figs, but I love them, so we are just going with it today. ps. if you’ve never actually tried a fig, try one! You’ll never know if you like em’ until you try em’! 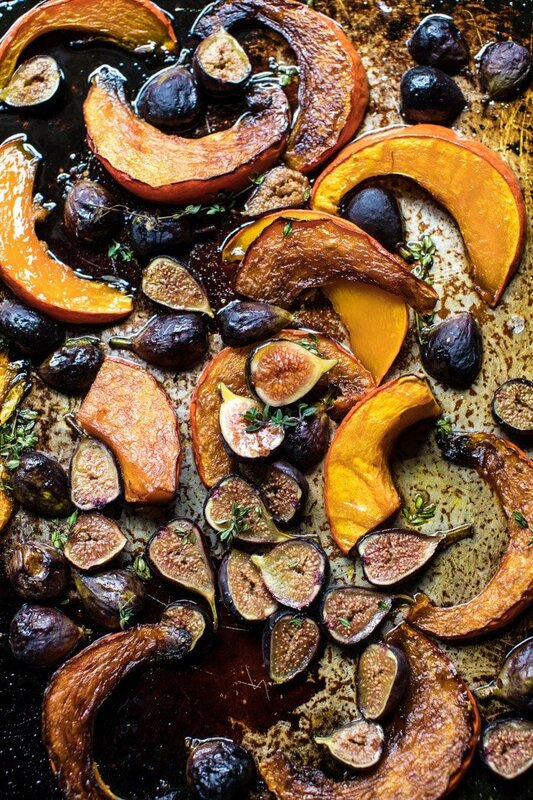 The squash and figs get roasted up together with a little honey. 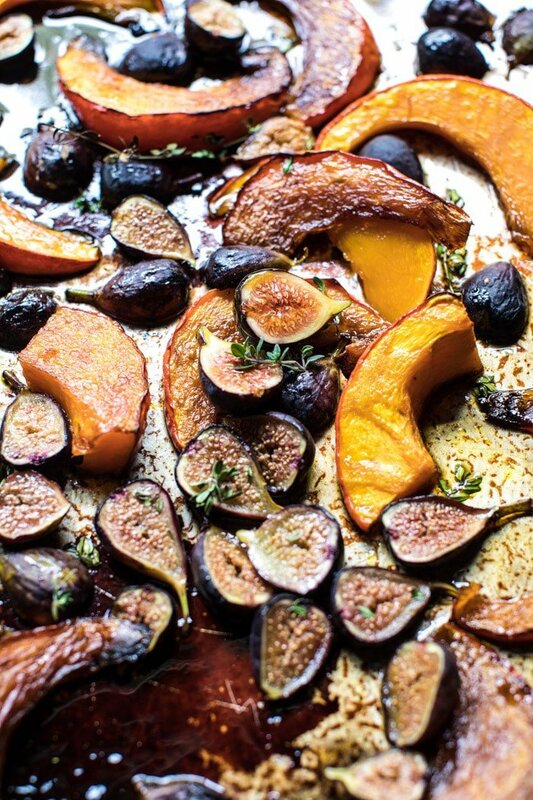 The honey helps to caramelize both the squash and figs and it is truly one of the most delicious things to come out of your oven. 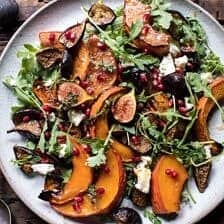 The squash and figs as a side dish alone would be delicious, but they’re better in a salad…with feta. Once you’ve roasted up all that fall goodness, you really just assemble the salad. I then made a quick and simple cider vinaigrette that’s hinted with warming orange zest and fresh thyme. I finished off the salad with feta cheese and pomegranate arils. So simple, so delicious, and light and healthy too…which I’m thinking is kind of nice, since most of my recipes this month sway much more on the extra cozy side. This is a perfect a side dish, light lunch, or can even served up at this year’s Thanksgiving table (for those of you who like to plan ahead). And lastly, I just want to say a quick note about all the recent sadness in the world. When I heard about the the tragedy that took place in Las Vegas on Sunday night, my heart just sank. I don’t often talk about these types of things on the blog because sometimes they feel so personal and real that it’s hard for me to talk about. But I guess today I just have to voice my feelings. I don’t know why awful events like this happen, but I am praying for everyone affected, and wishing for brighter days ahead. To everyone suffering, hang in there and stay strong. My thoughts and prayers are with you guys. Also, if you happen to enjoy cooking and or baking, remember that offering someone a meal, or even just a home baked cookie, can somehow make a difference. It won’t change the situation, but it might just make someone feel a little better, and even if it’s only for a few minutes, it’s worth it. Here are a few recipes that would be great for gifting to someone who needs a helping hand today…no matter what the reason. This salad is light, healthy, simple and delicious. This is the perfect fall side dish, light lunch or addition to your Thanksgiving menu. 2. 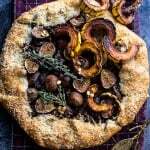 On a rimmed baking sheet, toss together the squash, 2 tablespoons olive oil, honey, 1 1/2 tablespoons thyme leaves, and a good pinch of salt. Transfer to the oven and roast for 20 minutes. Remove from the oven, add the figs to the baking sheet and toss to combine. Return to the oven and roast another 10-15 minutes or until the figs have caramelized. If using dried figs, cook them only 5 minutes. This will soften them. 3. To make the dressing: In a mason jar, combine the remaining 1/4 cup olive oil, lemon juice, apple cider vinegar, remaining 1/2 tablespoon thyme, orange zest, and a pinch each of kosher salt and pepper. 4. 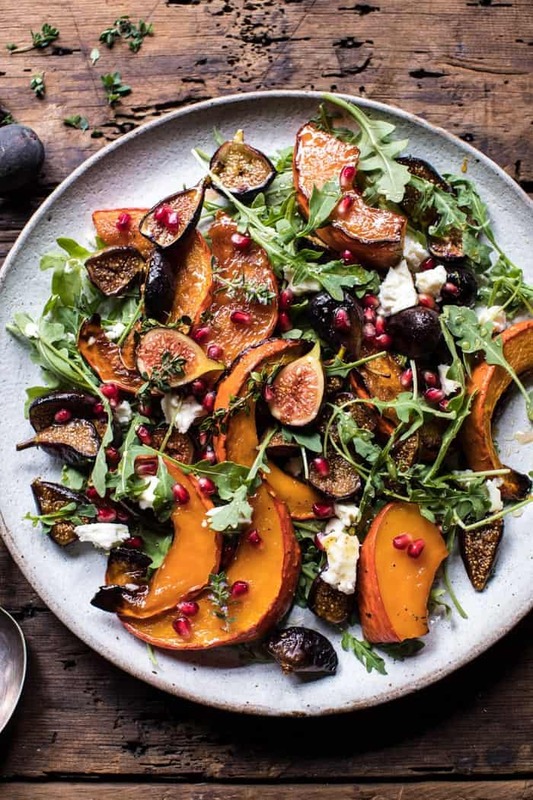 Add the arugula to a large salad bowl and top with the roasted squash and figs. Crumble the feta overtop and sprinkle with pomegranate arils. Drizzle with the dressing. Enjoy! Have a great Thursday everyone, and maybe tell someone how much you love them..hugs are encouraged as well. Yes! I hope you love it! Thanks Julia! I have never heard of this kind of squash but it sure looks yummy. Such terrible tragedies that have happened lately. So sad! 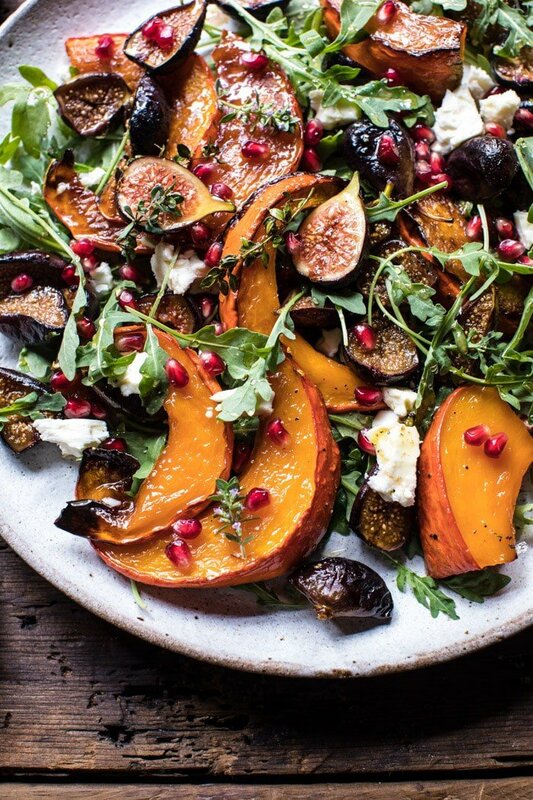 Well, I’m totally cool with you naming this THE salad of Fall because it’s gorgeous and I’m sure tastes equally amazing. Ah, I gotta get my hands on some of that kobucha squash! Thank you Tori!! You should definitely try this, I think you’ll love it! I’m making this for lunch because, arils aside, I have all the ingredients. I’ll use the last of my white currants instead… and perhaps some toasted pepitas, because crunch is always a good idea. Pepitas sound like a great addition! I hope you love this Heidi! 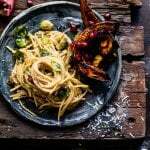 Looks Amazing..if only this recipe was published while figs were still in season! Any substitutions for figs? I live in California where it’s still warm but figs are here and gone! I rarely find a recipe that is appealing. This one looks fabulous and with a quick glance seems doable. Thank you for mentioning the sadness that affects all of us with the Las Vegas tragedy. You are right…something as simple as the sharing of food can brighten our days. Will make this recipe for thanksgiving..and will always be grateful. I am so glad you like this recipe Christine! Thank you! Fenomenal! This looks absolutely amazing, I think I will make it very soon. Have some fresh figs in the fridge, so perfect timing. This is exactly the kind of salad I like in this season. 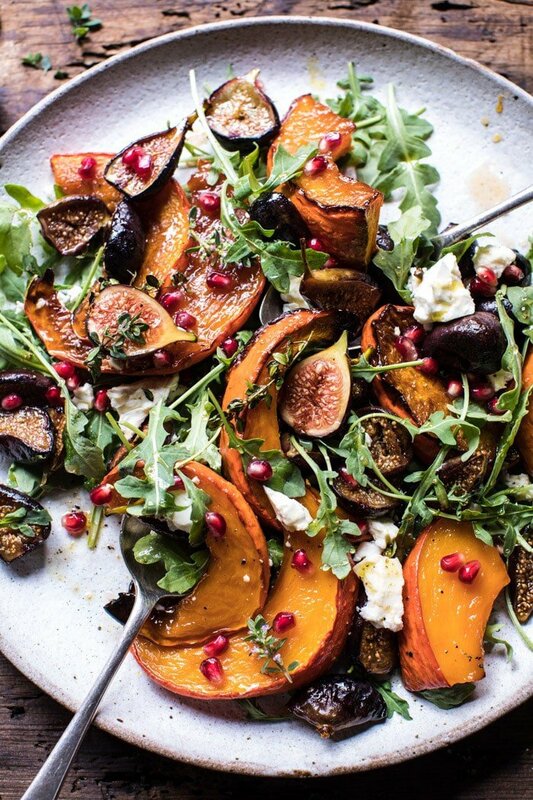 Roasted pumpkin and figs are among my favorite ingredients and I love everything with feta. I will try the recipe not later than this weekend! Oh, and also I LOVE your new book, it’s simply amazing, love every single recipe in it. So glad you’re loving this salad! Thank you Del! This may seem like a silly question but do you leave the skin on the squash? Can you make this the day ahead? 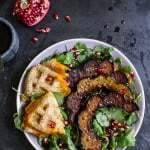 I have been looking for a recipe that incorporates squash and figs! This is perfect! My only hesitation is the honey…won’t that make it super sweet? This salad was absolutely amazing. I will definitely be making this for my family when I go home for the holidays. I made it tonight without feta because I didn’t have any, so I can’t even imagine how incredible it will be with feta! I am so glad you loved this and I hope your family does as well! Yes, try it with the feta it is so good! Thanks Nina! Everything that I make from your blog is amazing – this was not an exception! I’ll be adding it to my repertoire. Thank you!! That makes me so happy! Thank you Lynne! This recipe is amazing! It’s so beautiful! My guests could not stop raving about how pretty it looked and how delicious it was! I’m adding this to our Thanksgiving menu! That is so amazing to hear! Thank you so much! I hope you love this salad, it’s one of my favs! Also, I hope you and your sisters love the book, let me know what you make out of it 😊 Thank you Becca! Will this salad be served warm, cold, or at room temperature? This looks amazing. I want to make it for Christmas dinner. Would burrata work as the cheese instead of feta? What about a burrata with truffle oil? for bookmarking and addding your RSS feed to my Google account. Oooh…this is so gorgeous! I love fall salads like this. 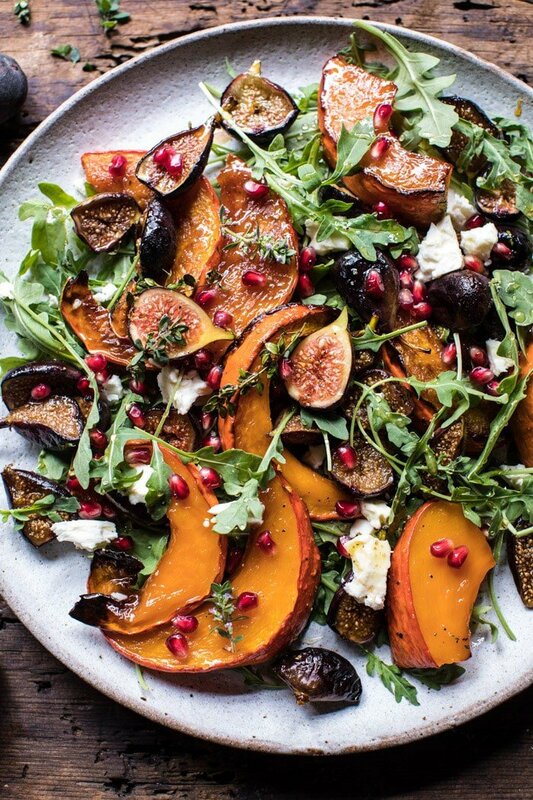 That mix of roasted squash and sweet figs must pair so well with that peppery arugula! I am so glad you loved this recipe Amanda! Thank you so much for trying it!